As Sam Alexander and Richard Rider lay unconscious, Titus walks up to Rich. The former Black Nova recognizes Rich and claims Rich Rider was better than all other Novas. As Titus announces he intends to take Rich's helmet for himself, Death's Head realizes something odd is happening to his input data. Suddenly the two Novas disappear! Cosmo has used his telepathic powers to make it appear Sam and Rich are no longer visible. The Russian space dog changes tactics and begins attacking the minds of the bounty hunters. However, Death's Head has an inorganic brain and is not affected. The cybernetic being blasts Cosmo unconscious! The bounty hunters turn to find the Novas awake and angry. Death's Head mentions they were hired by someone to deliver the Nova helmets. After Sam informs Rich on who their enemies are, with the exception of Death's Head who he doesn't know, Titus steps forward. 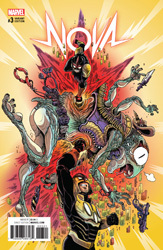 The tigeroid alien insults Sam's father which causes Sam Alexander to launch a ferocious attack. Titus shrugs off the assault and blasts the teen hero unconscious. The three bounty hunters turn their attention to Rich Rider. The more experienced and powerful Nova holds off all three attackers and knocks Titus unconscious with a single punch. Realizing they cannot defeat the older Nova, Death's Head reveals their secondary plan. The cyborg shows the Novas a hologram of a powerful explosive device planted in the cosmic energy center of Knowhere. Sam turns to Rich and asks him what they should do. Death's Head insists they are only there for the Black Nova helmet and nothing else. Rich and Sam remove their helmets. Suddenly, Sam hears Rich and Cosmo inside his head. Rich had the telepathic canine link their minds together in order to communicate silently. Rich begins stalling the alien hunters with quotes and anything else he can think of. At the same time, Rich mentally has Cosmo scan all of Knowhere for the Chitauri warriors guarding the bomb. Cosmo states he cannot find them. 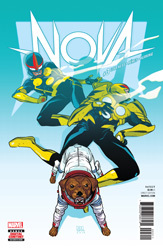 Rich Rider Nova suggests that the guards have shields blocking the space dog's scan. He tells the Russian to look for a blank spot. Cosmo finds the guards and the older Nova instructs him to give Sam the information. Richard Rider tells Sam Alexander to fly to the location and defuse the explosive. Rich intends on stopping the bounty hunters from detonating the bomb but wants Sam to there in case he fails. The younger Nova is unsure of the plan and suggests they turn over the helmets in order to save lives. Rich emphasizes that giving them the powerful Black Nova helmet would cause the death of many more people. He tells his young partner that being a Nova means taking risks and stepping up to the challenge. Rich Rider Nova walks forward to Titus with his helmet in hand. Instead of handing it over, Rich turns and hits the tigeroid in the head with the helmet! As Death's Head attempts to order the guards to detonate the weapon, the older Nova puts his helmet back on and orders the younger Nova to find the bomb. Rich blasts the cyborg as Titus hits the hero from behind. The three bounty hunters begin attacking Richard Rider. The Chitauri warrior throws his bladed staff which cuts through Nova's shoulder! Meanwhile, Sam Alexander Nova has found the explosive device. Unfortunately, Titus has ben able to finish Death's Head's destruct order and the bomb begins glowing! Back in the Knowhere bar, the bounty hunters approach the injured Rich Rider. Titus comments that the older Nova should have stayed dead. Rich's eyes turn white and wonders who said that he didn't. Suddenly, Nova's body morphs into a hybrid of human and Cancerverse creature and rips the Chitauri warrior in half! As Titus and Death's Head teleport away in fear of their attacker, Rich hears Sam calling out telepathically for help. Sam's voice causes Rich's body to return to human form and he flies off to assist his young partner. At the center of Knowhere, Sam Alexander Nova is desperately trying to stop the explosion. Rich instructs him to use the Nova Force to hold back the bomb's explosive energy. Sam tries furiously to contain the blast but fails and falls unconscious. However, his efforts have given Rich Rider Nova enough time to arrive at the site. The older hero once again becomes the alien/human hybrid and uses organic Cancerverse material to contain the explosion! With the threat over, Rich falls to his knees. Sam regains consciousness and asks if they won. The sound of his partner's question once again causes Rich to regain his human form. Since the older Nova had his back turned, Sam hadn't seen Rich's hybrid form. Rich Rider assures his fellow hero that they did okay. Later in Starlin's Bar, the heroes have a discussion about Sam's interest in Lina. The teenager is uncertain that he should ask her out on a date. He explains he's afraid of being rejected. His mentor tells him that if he's rejected, then he just moves on with life. Rich reveals that looking back on his own life, he wishes he had talked to more girls. His young partner asks his new friend what it was like being dead. Rich claims it was boring and now he is going to live life to its fullest. Elsewhere on Earth, a woman enters Rich Rider's quarters located inside the NY World's Fair Unisphere. Inside are momentos of Nova's past battles and friendships. The mysterious person takes a half torn strip of photos from the wall. She pulls out the missing half from her own pocket and matches it up with Rich's. The woman is revealed to be the one in the photos and also Rich's past love interest - Gamora.